Prince Albert II of Monaco (right) receives the International Honorary Doctorate from Academy President and CEO Dr. Thomas P. Rosandich (left) recently at the Peace and Sport International Forum in Monaco. Two heads of state who are former Olympians and who have made great contributions to the Olympic Movement were recently honored by the United States Sports Academy. University President and CEO Dr. Thomas P. Rosandich presented the Academy’s International Honorary Doctorate to H.S.H. Prince Albert II of Monaco, who is the only head of state who is a five-time Olympian in the bobsled and International Olympic Committee (IOC) member. He also gave the Academy’s 2011 Eagle Award to Hungary President Pál Schmitt, who won two team épée gold medals in fencing and was once a candidate for the IOC presidency. Both award presentations were made at the fifth edition of the Peace and Sport International Forum on Thursday, Oct. 27 in the Principality of Monaco.  Albert, who graduated in 1981 with a bachelor’s degree in political science from Amherst College in Massachusetts, steered the two-man and four-man bobsled in Winter Olympics between Calgary in 1988 and Salt Lake City in 2002. He also has been an active IOC member since 1985, serving on several committees, including the cultural, marketing and nominations committees. Albert, who holds voting rights on Olympic venues, has also served on the Coordination Committees for the Olympics in Atlanta in 1996 and Turin, Italy, in 2006. He has served as president of the Monaco National Olympic Committee (NOC) since 1994. 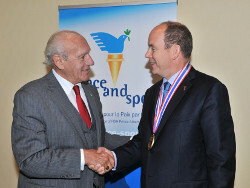 Hungary President Pál Schmitt (right) earned the Academy’s 2011 Eagle Award for his longtime commitment to the Olympic Movement from university President and CEO Dr. Thomas P. Rosandich (left) recently at the Peace and Sport International Forum in Monaco. 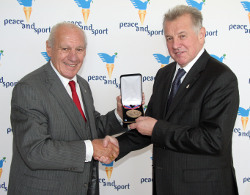 Schmitt earned the Eagle Award, the Academy’s highest international honor which annually goes to a world leader in sport to recognize that individual’s contributions in promoting international harmony, peace, and goodwill through the effective use of sport. The 69-year-old Schmitt devoted nearly 25 years to the Olympics during his career and earned two team épée gold medals in 1968 in Mexico and 1972 in Munich for the Hungarian National Fencing Team. Schmitt, who earned election in August 2010 as Hungary’s president, served the IOC as its Chief of Protocol and presided over the World Olympians Association between 1999 and 2007. Elected as an IOC member in 1983, he served as vice-president of the IOC from 1995 until 1999. He was a candidate for the IOC Presidency in 2001 and finished fourth. In Hungary after the end of Communism in 1990, he became president of the Hungarian Olympic Committee. Share This Article on Your Social Media! Academy Library Director Dr. Vandy Pacetti-Donelson Presents at Book Festival in Hattiesburg, Miss.